A Photoshop Elements project has an advantage over a PDF document in regard to revising the content. You can simply open your project, make revisions, and produce the slide show — something you cannot do with a PDF file. 1Open the Organizer and select the pictures you want to use in your slide show. You can also choose files you may have open in the Photo Bin in the Photo Editor. 2Click the Create button in the Panel Bin and click Slide Show. The Slide Show Preferences dialog box opens. Just about everything in the dialog box can be adjusted in the Slide Show Editor, so don’t worry about making choices here. If you want to keep the Slide Show Preferences dialog box from reappearing when you make slide show creations, deselect the Show This Dialog Each Time a New Slide Show Is Created check box. 3Click OK in the Slide Show Preferences dialog box. 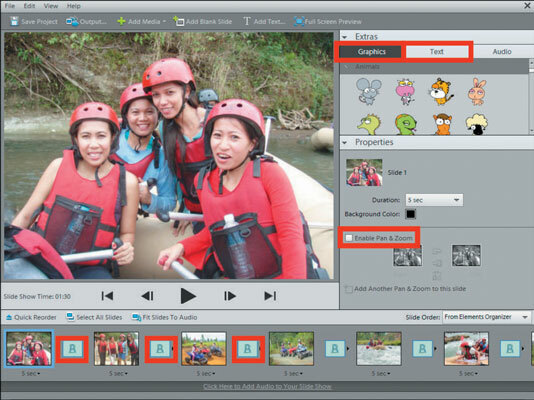 The Slide Show Editor opens, as shown in this figure. 4If your Slide Show Editor doesn’t show a screen similar to the one in the figure, click the Maximize button in the upper-right corner of the window. This way, you can see the timeline at the bottom of the screen and the Panel Bin on the right side of the editor. 5(Optional) Create a Pan & Zoom view. When slides are shown, you can zoom and pan a slide. Select the Enable Pan & Zoom check box and click the Start thumbnail. A rectangle appears in the preview area. Move any one of the four corner handles in or out to resize the rectangle. Clicking inside the rectangle and dragging the mouse enables you to move the rectangle around the preview. For the end zoom position, click the End thumbnail and size the rectangle to a zoomed view or a view where you want to stop the zoom. Notice in Figure 16-6 that the End thumbnail is selected and the rectangle is sized down to the zoom area on a portion of the photo. A library of graphics appears on the Extras pane in the Panel Bin. Drag a graphic to a slide. If you want a blank slide to appear first and then add text and graphics to the blank slide, click Add Blank Slide on the Shortcuts bar at the top of the editor. Click the Text tool on the Extras pane in the Panel Bin and then drag a text style to the blank slide or the opening slide in the slide show. After you drag text to a slide, the Properties pane opens in the Panel Bin. The text you drag to the slide becomes a placeholder. To edit the text, click Edit Text in the Properties pane. You can also select a font, style, size, color, and alignment. After setting the type attributes, click inside the text and move it to the position you want. The icons between the slides in the timeline (at the bottom of the Slide Show Editor) indicate a default transition. You can change transition effects for each slide independently or for all the slides in the show. Click the right-pointing arrow on the right side of a transition icon to open a pop-up menu containing a number of transitions, as shown in the figure. If you want to apply the same transition to all slides, choose Apply to All at the top of the menu commands. Be conservative with the transition effects. Too many transitions of different types can make the slide show appear amateurish and can be distracting to the viewers. 9(Optional) Add audio and media. You can add audio to the slide show by choosing Add Media→Audio from Organizer (or from Folder). Select an audio file and click OK.
You can also add movie files to your slide show. A movie file can be added on top of a slide or on a new slide. When you play the slide show, the video file plays. Choose Add Media→Photos and Videos from Organizer (or from Folder). You can add more pictures to the slide show with the same menu command. 10(Optional) Record your own sounds. If you want to add narration, click the Narration tool (represented by a microphone icon to the right of the Text tool) in the Panel Bin. The Extras panel changes to provide you with tools to record a sound or import a sound file. Note that this option requires you to have a microphone properly configured on your computer. 11(Optional) Fit slides to the audio. If you have 3 minutes of audio and the slide duration is 2 minutes and 30 seconds, you can, with a single mouse-click, fit the slide duration uniformly to fit the 3-minute audio time. Just click the Fit Slides to Audio button below the preview image. If you want to manually adjust time for slide durations, click the down arrow on the time readout below the slide thumbnails in the timeline. 12Click the Output button on the Shortcuts bar and then, in the dialog box that opens, type a name and click Save. Your project is added to the Organizer and is available for further editing later. Or you can open the project to save in a number of different output formats. Before exporting the slide show, you can see a preview by clicking the buttons directly below the image preview area. If you want a full-screen preview, click the Full Screen Preview button on the Shortcuts bar and click the Play button. If you don’t like the order of the slides when you open the Slide Show Editor, you can easily reorder the slides by dragging them back and forth along the timeline.